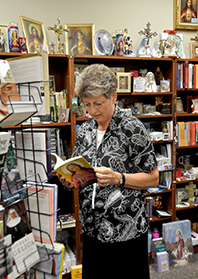 St. Michael's Gift/Book Store was birthed at St. Michael the Archangel Church through the apostolate of The Legion of Mary and the stewardship of Covenant Dwelling Books. The Mission of the Gift/Book Store is to aid the parishioners of St. Michael's in the evangelizing efforts of the Holy Mother Church. Business Hours: We are open after all weekend Masses, Saturday 4:00 pm, and Sunday from 8:30 am to 12:30 pm. We do not do online purchasing, or shipping. We offer affordable rosaries, books, medals, Baptism, First Communion, and Confirmation gifts as well as statues, music, DVD's, crucifixes and much more. Come check us out. We are located in the parish, Room 100, which is directly across from the parish hall on the north side of the hall. St. Michael that Archangel, Protect us against the snares of the devil. Mary Queen of the Angels, Pray for us! 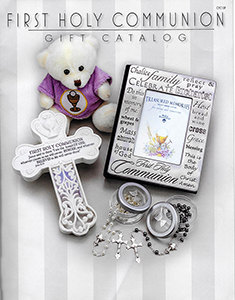 A reminder to parents of First Communicants, you can order your first communion gift items from the First Holy Communion Gift Catalog you were given recently. Place orders with Mona in St. Michael’s Gift/book Store, which will save you shipping charges when you place your order there. Get your orders in soon!